**** Chosen by Winner: Michael S.
L PAK 5 Set (34.95), 1 each Super Fine Grit (1200), Fine Grit (600), Medium Grit (400), Coarse Grit (250) & Extra Coarse Grit (150) diamond pads. EZE-LAP Diamond products has been the pioneer and originator of diamond sharpeners since the early 1970s. Our unique diamond process and modern technology allows EZE-LAP to produce the finest quality diamond products for the lowest possible price. The unique process of heat treatment that bonds the highest quality industrial grade diamond particles in a stainless alloy to a precision matched metal substrate has been imitated but has never come close to being duplicated. The resulting suface integrity from the EZE-LAP process measures about 72 on the Rockwell C hardness scale. By utilizing our technology, EZE-LAP has created a surface that works on carbide, ceramic, tool steel, hardened materials and newer stainless steels that are utilized by most major knife manufacturers today. EZE-LAP boasts about its quality. We are proud to offer the flattest, most consistent production diamond tools avalable on the market today. Even after years of satisfaction, EZE-LAP customers are still amazed at the quality and consistency of the finishes that are achieved by the diamond tools. This kind of quality is achieved by a product entirely made in the USA and we take pride in that! 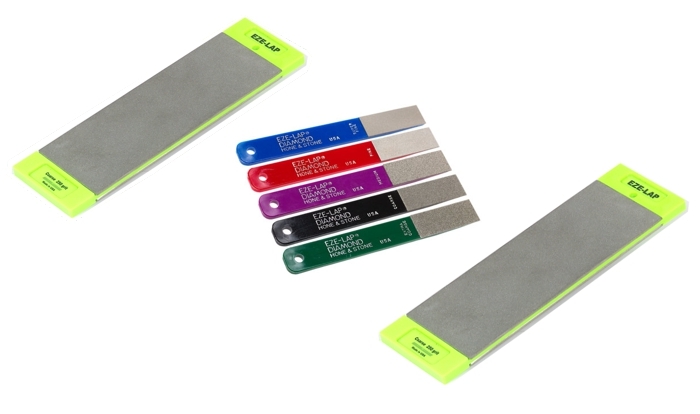 Whatever your sharpening needs, EZE-LAP has the diamond product for your knives and tools.